Thirteen riders gathered on the Piazza . Jude Lawrence, Christine Rogers, Roz and Paul Delderfield, John Gilbert, Pete Hargreaves, Steve Smith, Thom Green, Nigel Andrew, Jonathan Angilley, Rod Tinson , Niq Carter-Rowe and ride leader John Flowers. We headed out of the city up the Idless Valley through St Allen and crossed the A30 near Zelah then through the famous hole in the hedge . Christine left us here and headed on back to Shortlanesend . We continued on to Fiddlers Green and Cubert . Thom disappeared into a stream crossing a bridge on a muddy bend but climbed out wet and luckily only with a damaged pride. Time to change those skinny tyres for the winter I think?. We arrived at our new Cafe stop just in time to choose from the breakfast menu Eggs Benedict, Bacon Butties,etc lovely with a view across the estuary to Newquay. Jonathan and Rod left us here and returned to Truro for their Sunday roasts I think and were replaced by Paul and Hannah who joined us for coffee . We headed for home by various routes, John,Jude,Thom Paul and Hannah went via St Newlyn East,Mitchell and Ladock while the rest went onto Goonhavern and home . 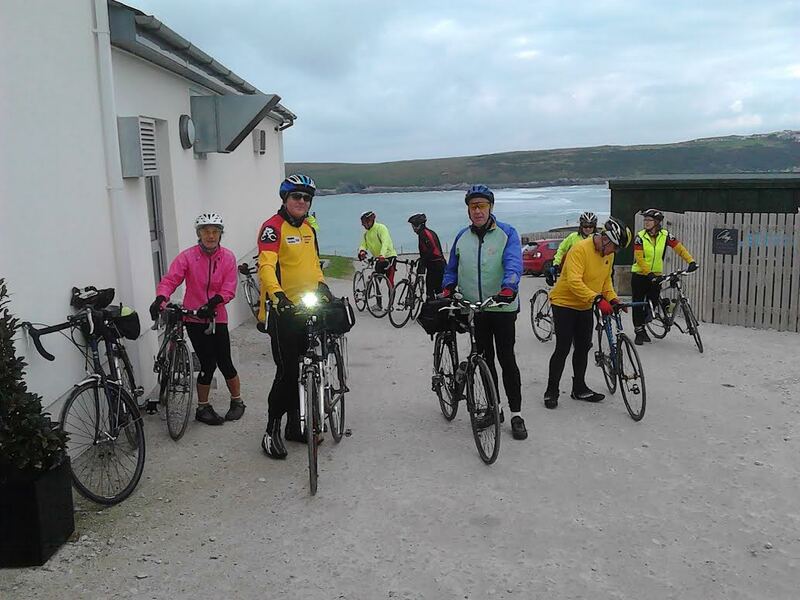 Fifteen riders turned up in all and distance was 33.5 miles at an average speed of 11.3 mph. Some of the riders leaving the C Bay cafe.